This new trend of the fishing industry that fishermen are setting with their fishing gear is the modification & upgrade tuning and customizing of their reels to high performance fishing machines got our attention and astounded us that so many fishers have never known about this tip. 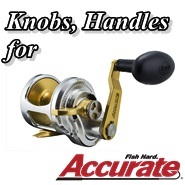 By replacing the original reel parts with faster bearings, lighter spools, high end performance braking systems, customized handles and full bearing supported knobs, making a well value reel into a precision instrument for competition fishing. 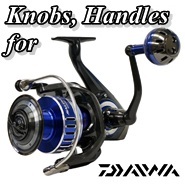 PBM Fishing never satisfies with the original reel Handles, Knobs and Arms of current brand name reels (Shimano, Daiwa, Avet, Accurate ... and so on). After be the long in the industry, we strongly recommend and trust the brand of Ultimate Jigging as your alternative to upgrade your original knob or handle to the custom one. Products of Ultimate Jigging are the best choice for custom fishing Reel Knob, Handle and Arm. It is well crafted from solid 6061-T6 aluminum stock with type two anodized and two-tone colors. It takes a lot of machine work; unlike other products only have holes and lines on it. Indentation design increases grip & more comfortable. It is very stylish and light in weight. It is designed in USA. 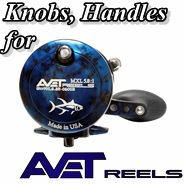 It is cheaper than the "original reel equipped Knobs or Handles or Arms" but better than those and it is with the best quality than any existing custom product in the market. Especially, after comparison, the Power Arm is stronger and lighter than the original ones of Shimano and Daiwa (13g vs 17g). Ultimate Jigging's Power Arm with Knob are with up to 25 colors combinations to be chose. 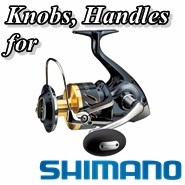 Accordingly, you shall take Ultimate Jigging into your consideration for your reel knob/ handle upgrade.